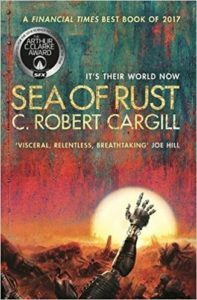 Sea of Rust by C. Robert Cargill, follows Brittle, a veteran of the final war between humanity and Artificial Intelligence. We, of course, lost and Brittle and her fellow robots have had the planet to themselves for years. The only problem is, they have no idea how to win. The One World Intelligences, or OWIs, the vast AI that masterminded the war are at war with themselves and where the head of this new society leads, it follows. For every robot that simply wants to get on with their lives, there’s one that wants to help end the lives of others. Brittle wants to be the first type, but she’s much closer to the second than she’d like. Especially when a disastrous salvage mission critically injures both her and Mercer, the only other robot of her class she knows of. A showdown seems inevitable but the OWI have other plans. Cargill is a screenwriter first and foremost and its impossible not to see the influence of his primary craft here. That’s not a criticism either, there’s no sense of this being a lightly expanded movie treatment designed to be dropped onto a producer’s desk as an unusually fancy leave behind. Rather, this is a book steeped in the iconography and tempo of modern American cinema and that’s both interesting and not always a good thing for book or reader. The novel ploughs familiar ground but does so in some unusually well thought out ways, starting with a structural trick that it shares with American War. Both are punctuated by cutaways from the main plot, documentation for American War and reminiscences here. The documents in American War directly impact on and even foreshadow the action but they’re also explicitly designed to be breaks in the action and to stand apart from the main story. In the context of the novel’s unrelentingly bleak world view that’s a welcome relief. But, I’d argue, it also damages the book a little. The tempo becomes spotty and erratic whereas the method Cargill uses here is far smoother. Those reminiscences fit neatly into the gradual systems breakdown Brittle is suffering, which in turn undercuts her constructed, hard-bitten exterior. This means that the novel’s structure maps onto the condition of its lead in a way that feels natural and clever rather than mannered and overt. 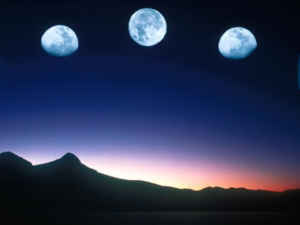 It also helps upend the largest of the major cinematic influences: New Moon Pictures. Charles Band’s legendary production house was the Blumhouse of its day, churning out ‘never mind the quality feel the width’ B-movies that hurtled to VHS and lived there for decades. Band is best known for the PuppetMaster series but his other movies include two seminal ‘80s classics I detect a slight hint of here. The first, Robot-Jox, sees international disputes settled with vast Mecha fistfights in the desert. The second, Trancers, is a cheerfully bargain basement Blade Runner knockoff with the best tag line in movie history (‘Jack Deth’s back. And he’s never even been here before.’) and a nicely snarky attitude. The ghosts of both walk the Sea of Rust, with the ruined, sub-western vistas evoking movies like Salute of the Jugger, the Cyborg franchise and Mad Max too. It’s all blasted atomic plains, ruined human civilisations and what grows in the spaces they leave behind. It’s heady stuff, these movies were the visual engine of their time and Cargill draws from a deep well here. It often works well, and I especially liked NIKE 14, the robot trading settlement built into an old missile silo. But he pays a price for it and that price is also connected to the novel’s other great influence; westerns. The vast majority of Sea of Rust is concerned with Brittle and Mercer, their slowly dawning High Noon and the ragtag fugitive march of their group across the Sea in what quickly becomes a mission of near religious significance. 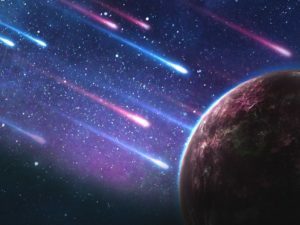 Cargill shows us an idea of vast complexity and importance, something that takes the New Moon and Charles Band roots of the story and connects them to something positively Wachowskian in scope and ambition. It’s vast and fascinating and once he does that it’s basically benched until the last couple of pages while we get a re-enactment of the end of The Magnificent 7. The intent here seems to be to contrast the constructed, brutal pragmatism of Mercer and Brittle with the nebulous beliefs of their companions. Cargill aims to sit this small scale intimate story of survival inside a much larger mechanism that simultaneously dwarfs it and shows us how vital those actions are to the bigger picture. it’s reminiscent, to continue the movie comparisons, of Gary Whitta’s script for The Book of Eli. Unfortunately, like that, it becomes too wrapped up in the small details to stick the landing on the larger concepts. That’s not helped by an ending which feels both rushed and like a set up for a sequel exploring what was hinted at here. I don’t appreciate novels that are secretly the first act of a three act, three book, story and Sea of Rust comes perilously close to that. This is where the novel is at its choppiest, simultaneously unpredictable and absolutely, relentlessly unsurprising. The closing fight, and Mercer and Brittle’s relationship feels like a tip of the hat too far to the apparent cinematic roots of the story. At the same time, we get some fascinating ideas about digital identity and gender as well as the ethics of living forever all sketched in but never explored in the depth they need to be. There are some brilliant ideas here and they’re almost always pushed aside in favour of easier, broader targets. There’s nothing wrong with shooting at those targets either. But Cargill aims higher too often here for the misses to be anything less than maddening. That’s compounded by his occasional willingness to aim for the absolute lowest hanging fruit possible too. 19, one of Brittle’s few friends, is a former sexbot who of course has a Heart of Gold. One of the asides reveals she loved her original owner, a socially awkward overweight shut in programmer and has never got over his death. I know I mentioned this in the short write up but this is such a lazy, offensive pair of tropes that it really does demand being put in the light a second time. It doesn’t just matter that 19 maps onto the ‘tough, doomed showgirl’ western trope. It doesn’t just matter that her offhanded murder, and brief existence, are designed solely to raise the stakes. It doesn’t matter that her first owner was born from the exact same single synapse thinking that thought Comic Book Guy wasn’t just funny, but representative of an entire culture with all the fat-shaming and celebration of terrible behaviour that goes hand in hand with that. It doesn’t even matter that 19 is described as a ‘sponge’ for his bodily fluids. It matters that all of this passed every single edit pass without anyone, once, suggesting that in a novel which so often does better, this section could perhaps be improved, expanded or removed. Choices like that, where the novel’s influences (as I perceive them) don’t so much weigh heavily a extrude through into the text are what pushes Sea of Rust out of contention for me. But I suspect Cargill is going to be on this list again in the future. Because for every mis-step there are moments that surprise and impress. Brittle’s early, deeply unlikable hard-bitten exterior is revealed to be a front in a well-handled, emotionally impactful moment of reminiscence. The true nature of the war is twisted in a manner that’s immensely cruel and depressingly plausible. A character who starts out as nothing but a trope with the serial numbers filed off becomes something much more complex and ethically nuanced. Much as the novel is Brittle’s long journey out of her self imposed night, it feels a lot like a transitional novel for Cargill too. His SF work has never been in prose form before and while this is an intensely uneven, occasionally profoundly frustrating novel, there’s real promise to it. I hope Cargill stays around in the field. Because now he’s crossed the Sea of Rust, I’m very interested to see where he goes next. When Alasdair Stuart isn’t hosting PseudoPod or running Escape Artists Inc., he’s professionally enthusiastic about genre fiction at places like Tor.com, Barnes & Noble, The Guardian, Uncanny Magazine, SciFi Now and MyMBuzz. 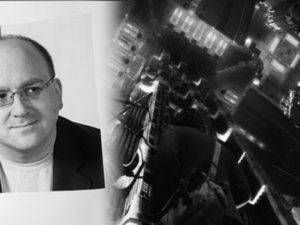 He’s an ENie-nominated writer for his work on Doctor Who: Adventures In Time And Space, and has written for the Star Trek and The Laundry Files RPGs, among others. Alasdair’s first collection of expanded podcast essays, PseudoPod Tapes, is available from Fox Spirit Books with volume 2, Approach With Caution, out later this year. His short stories can also be found at Fox Spirit, among other places. He lives in the UK with the love of his life and their expanding herd of microphones. Follow him on Twitter as @AlasdairStuart or on his blog, The Man of Words.